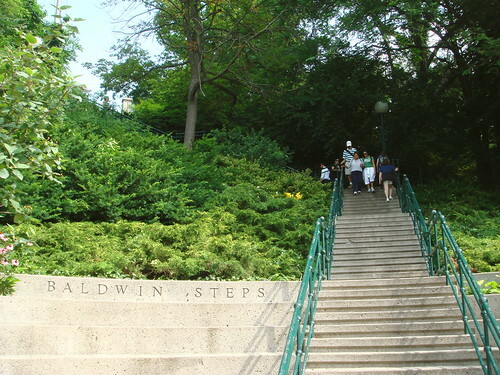 I've lived in Toronto for eight years but yesterday was the first time I had occasion to take the Baldwin Steps, which are just east of Casa Loma. 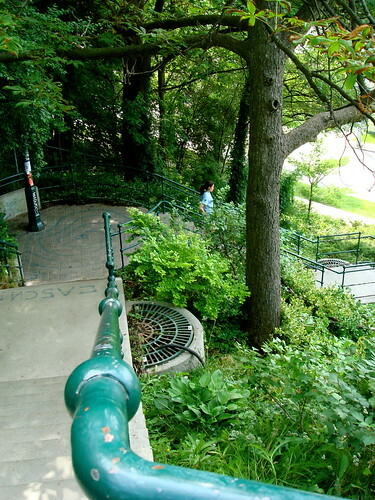 The Baldwin Steps mark one of the steepest bits of terrain in central Toronto. The steps cut into the bluffs of ancient Lake Iroquois. Approximately 13,000 years ago, during glaciation, the body of water that is now Lake Ontario had its shoreline around the present Davenport Road. Everything south of the cliffs was underwater. The edge of the glacial lake is what accounts for the distinct change in elevation that cuts east-west across the city. 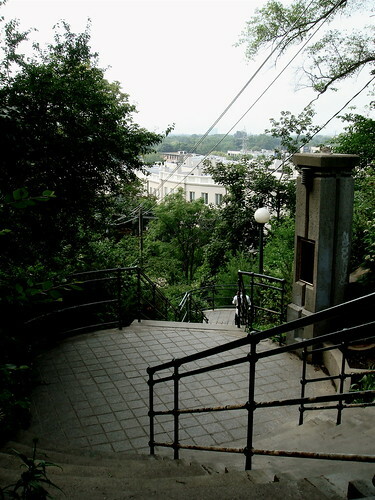 The path of Spadina Road takes a meander here in order to avoid the steep incline, but the stairs take a more direct route. For about 60 seconds, I felt like a tourist in my own city: this narrow little park seems so different in atmosphere and topography from the rest of Toronto. It reminded me of Sydney or Montmartre or San Francisco. I didn't even know this existed! And it's so close to me, I can walk there. I should check it out when it's not so hot and humid. I love the Baldwin steps! Great bit of exercise trying to run up and down them. I miss the steps... since we moved I haven't walked to downtown. the steps have quite a view. well i guess that is where i'll visit next time i'm in toronto.